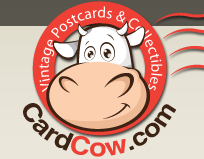 In 1896, the U.S. Post Office Department began rural free delivery in Wisconsin, Michigan, Illinois, Iowa and West Virginia on an experimental basis. On November 16, Sun Prairie became the first community in Wisconsin to initiate rural free delivery, with four routes. Each carrier rode 20 to 30 miles daily delivering mail in an area of 60 square miles, for a salary of $25 a month. The first appointed carriers included: Charles Woerpel, James Dunphy, Charles Phillips, and William Evans. William Mosel was Sun Prairie Postmaster at this time. Village merchants initially opposed free delivery, fearing loss of business if farmers did not come to town for their mail. After a month's trial, satisfied farmers announced they would carry on the service themselves should the Postal Service discontinue it. Rural free delivery continued and became a permanent service. House-to-house delivery in the village did not begin until 1950. The marker is located adjacent to the parking lot at the Sun Prairie Post Office, on the southwest corner of the intersection of Linnerud Drive and Clamar Drive, at 1715 Linnerud Drive, Sun Prairie, Wisconsin 53590. Rural Free Delivery and My Dad, in the Early Days of Rural Mail Delivery in Dane County, Wisconsin. 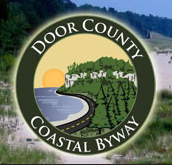 This media file used with gracious permission of Dane County Historical Society. 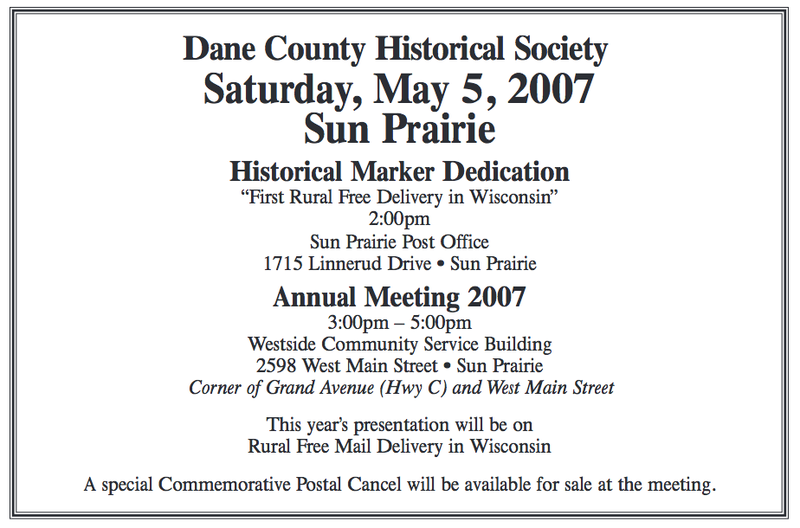 The Dane County Historical Society collaborated with the U.S. Post Office to issue a customized postal cancel stamp commemorating the 2007 marker dedication. This is a scan of an envelope bearing that postmark. The marker is visible in the distance, to the left of center.